The 50th Atlas 5 rocket arrives at the launch pad. Photo: United Launch Alliance. 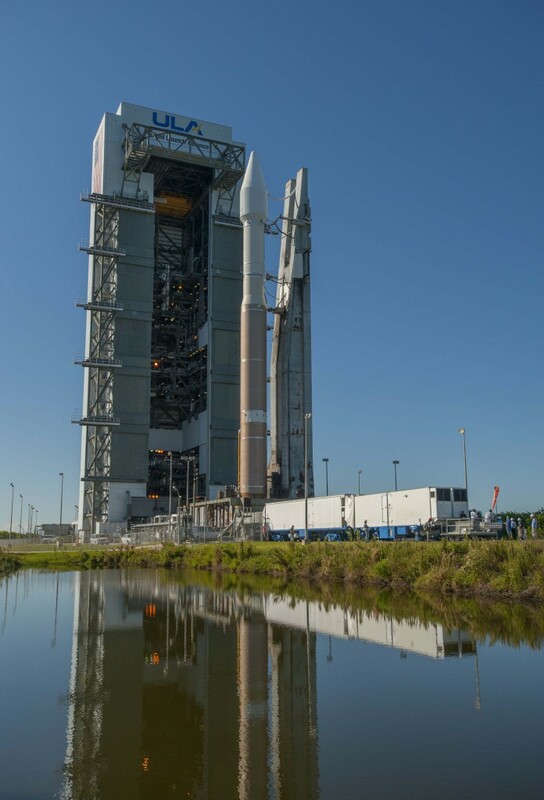 An Atlas 5 rocket has been rolled out to its launch pad at Cape Canaveral for blastoff Wednesday to deploy a replacement satellite to strengthen the Global Positioning System for U.S. military forces and the worldwide economy. 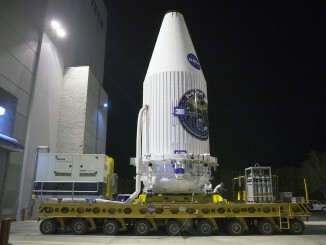 The United Launch Alliance booster was wheeled to Cape Canaveral’s Complex 41 this morning aboard a mobile platform, emerging from the assembly building where the rocket’s two stages and the payload were integrated over the past month. The slow, half-hour drive from the 30-story Vertical Integration Facility to the launch pad used a pair of specially-made “trackmobiles” to carry the rocket’s 1.4-million pound mobile launching platform along rail tracks for the 1,800-foot trip. The Atlas 5 is hauled out to the launch pad. Image: United Launch Alliance. The 189-foot-tall satellite booster was moved to Complex 41 for launch of GPS 2F-8, the latest satellite to replenish and upgrade the navigation network. 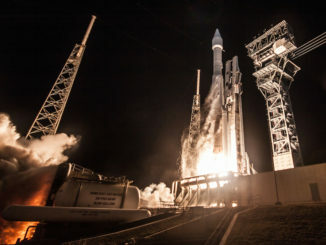 “The GPS 2F-8 satellite vehicle is ready for launch, and the improved capabilities of the GPS 2F satellite continues the legacy of delivering global positioning, navigation and timing services” said Col. Bill Cooley, director of Space and Missile Systems Center’s Global Positioning Systems Directorate. The Atlas 5 rocket departs the Vertical Integration Facility at Cape Canaveral’s Launch Complex 41. Photo: United Launch Alliance. 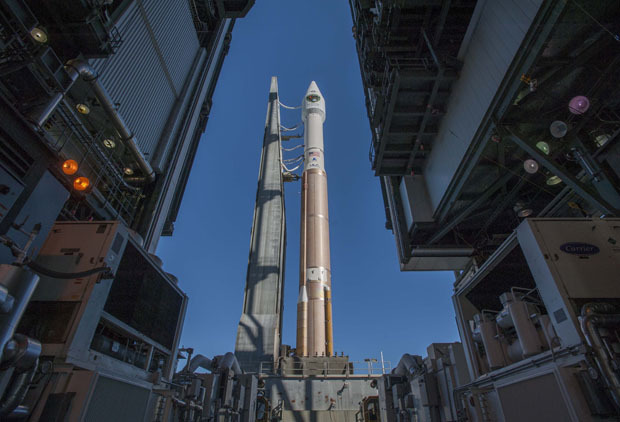 The Atlas rocket is flying the 401 vehicle configuration for the 26th time in 50 flights. 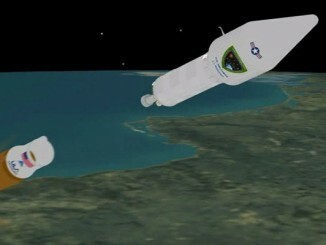 The version features just two stages, no solid rocket boosters and a four-meter-diameter nose cone. 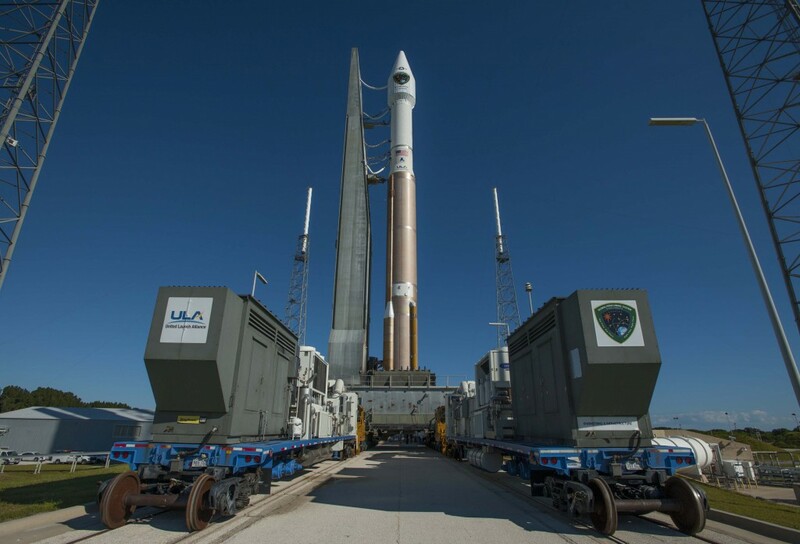 It is powered off the launch pad by an RD AMROSS RD-180 main engine and the Centaur upper stage is equipped with an Aerojet Rocketdyne RL10. 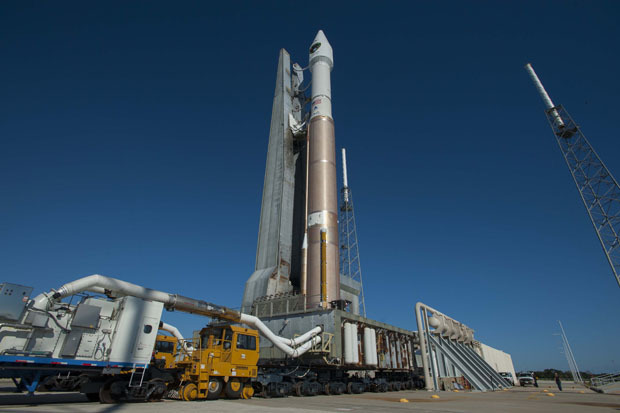 Wednesday’s available launch opportunity begins at 1:21 p.m. and closes at 1:39 p.m. EDT to send the rocket on a northeasterly heading into the GPS constellation. There is a 70 percent chance of acceptable weather. The Atlas 5 rolls to the launch pad. Image: United Launch Alliance.